CRP has had an ongoing relationship with ARISE High School, beginning with several small indoor murals in classroom and hallways. 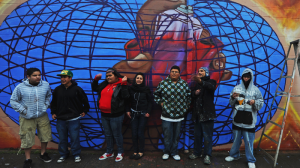 At the beginning of 2012, CRP artists lead a team of 20 youth on a large scale mural on a blighted auto shop at 8th Ave. and Fruitvale. Despite experience in the aerosol medium, the students took on exceptionally difficult tasks of drawing sacred geometric patterns, accurately rendering the Mexica Sunstone (Aztec Calendar), and drawing the magnetic field of the heart. The resulting “Heart and Mind” mural was a source of pride for everyone involved. 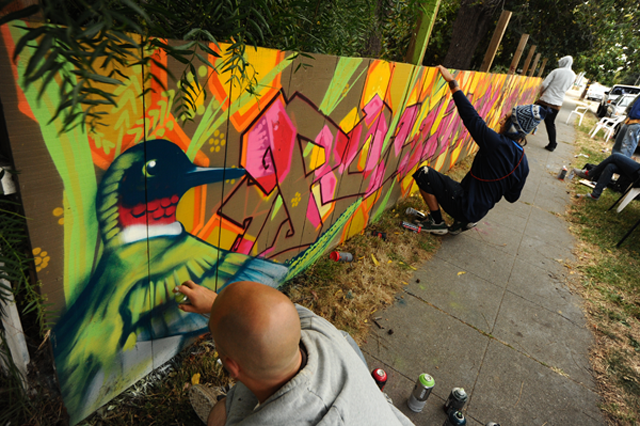 CRP began its collaboration with ACGAN in 2010 by painting a live community mural at its 10/10/10 event held in conjunction with a nationwide day of action with 350.org. This project was followed up with another mural the following year highlighting the role of bees called “Pollinate Your Community.” CRP remains involved with this grassroots program to transform the blight in Ashland and Cherryland.